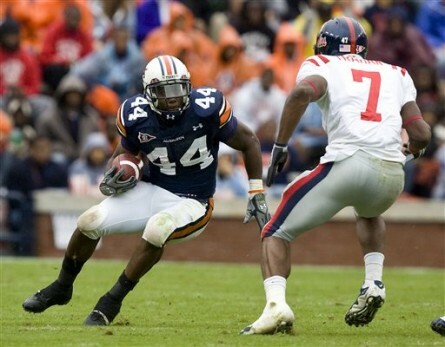 Auburn’s Ben Tate and Stanford’s Toby Gerhart also helped their respective causes. Tate (5-11, 220) put up an official 4.43, and impressive results in the broad jump (10-foot-4) and 225-pound bench press (26 repetitions), while also finishing tied for second place in the vertical jump (40½ inches). He carried over the momentum from a good Senior Bowl week and helped himself this week. You’ll recall that Auburn fans had been saying all year that no, really, Tate was just as fast as he was strong. Not many outside of the Auburn fellowship believed us, but maybe a nice plum first-day selection will make our case for us. More Tate: he’s not exactly retracting that tough talk about Mark Ingram from the tail end of last year, is he? Which is how it ought to be. Why should any athlete admit that another athlete’s better unless, you know, there’s some enormous gulf between them? There’s no such gulf here. I think we all knew that despite the secondary violations and associated punishments that there was going to be a second Big Cat Weekend, right? We were all right. As long as they cut out the NCAA funny stuff, this is good, good news, since I’ll take hot-air recruiting optimism over a total absence of football news any day of the week. Or any week of the offseason, to be more accurate. He spent last season as the passing game coordinator at Smiths Station High School. Not the head coach. Not even a coordinator. Best of luck, Bayou Bengals. Game 1, vs. Boston College: Auburn’s first serious competition of the season resulted in its first big-time thriller of the season as Brian Fletcher smashed a solo home run in the bottom of the 10th for a 6-5 walk-off victory. Those are always fun. Perhaps most encouraging for Auburn was that after a sloppy opening series against Southeast Missouri St., the Tigers finished the game without an error. Game 2: vs. Missouri: Unfortunately for the Auburn fans geared up from the Wall of Fame ceremony and ready for some hot Tiger-on-Tiger action, Missouri jumped on Auburn starter Grant Dayton for six runs through 4 1/3rd innings and cruised from there. Game 3: vs. Florida Atlantic: John Pawlowski may have found gem in first-year starter Cole Nelson. After pitching six scoreless innings in his debut against SEMO, Nelson fanned 12 Owls and allowed just one run through his six innings of work as Auburn routed FAU 17-4. At one point Nelson struck out 10 of 11 batters. But as encouraging as Nelson’s performances have been, it’s also reassuring to see that Auburn’s offense has thus far been as potent as advertised; the Tigers haven’t been held to fewer than 6 runs in six outings. Leading the charge is Fletcher, who connected for three homers over the weekend and was named the SEC Player of the Week. Good stuff. On paper, it doesn’t seem that Auburn’s 2-3 weekend at the NFCA Leading Classic in nearby Columbus was all that great, considering that all three teams to defeat Auburn–Kent St., Illinois St., and Southern Illinois–were non-BCS teams from the generally softball-light Midwest. Kent. St. hadn’t won a game this season before beating Auburn. But Andy Bitter says the competition was quality and the two victories did come over ACC teams, so maybe it’s not so bad. Auburn now sits at 9-6 overall on the season. In any case, none of that was remotely as exciting as what’s on tap for Tuesday: a visit from No. 4 Michigan. Both the men’s and women’s track teams finished sixth at the SEC indoor championships … Equestrian wrecking fools as always … Auburn had a decent enough night score-wise but it wasn’t nearly good enough to beat No. 4 Florida in gymnastics. You’re right, Lop, that is encouraging. I’m not expecting there to be any ambiguity at the end of the spring. Texas Tech fans have no idea how fortunate they are. Sounds to me like Malzahn has a pretty good idea what he’s getting with Mr. Newton. WDE! Ensminger must put on one hell of a job interview. Hell, Jerry… half of Auburn fans didn’t believe Tate was “that fast” last year… even when he was running away from defensive backs for long TDs. Tate was an senior, and Ingram was a sophmore, and Ingram still out-performed BT by more than you are willing to admit. Face it guys, Ben Tate can talk the talk, but he’s never going to be remember for walking the walk compared to Ingram when we get to compare their full careers.